Psychology Attachment Behavior: Find Out When to Expect the Constant Clinging or the Letting Go of Mom's Skirt! Within developmental psychology attachment refers to the emotional bond that exists between an infant and his or her primary caregiver (typically his or her mother). In attachment theory is perceived as necessary for the infant's physical and psychological survival. Takes the form of one of four attachment styles which is very much influenced by the quality of attention, sensitivity and responsiveness provided by the mother. May either be categorized as secure or insecure attachment both of which to a large degree shape the character of the child's self esteem, self confidence, and the expectations he or she has of e.g. romantic relationships later in life. Also changes in character as the child grows older ... which is what this page is about. 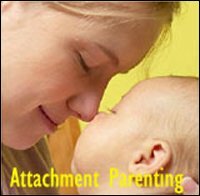 Here you will get the central points of attachment behavior as it gradually matures throughout the ages and stages of child development. Please be aware that the stages of child development occur differently for each child: some children develop attachment behavior and baby separation anxiety early, some late, some a little, some a lot, some, nothing at all. And this is all ok, all babies are different. 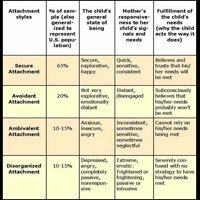 The attachment periods below are therefore general guidelines as they are presented in attachment theory. Attachment phases are relatively fixed periods. But again, don't be alarmed if your child does things earlier or later than indicated. For instance my own son showed clear-cut attachment behavior and strong baby separation anxiety much earlier and more intensely than the 'average' baby (you can read about my personal experiences here). 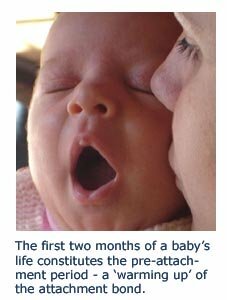 When the infant is between 0-8 weeks of age, the stage for developing secure attachment is being set. 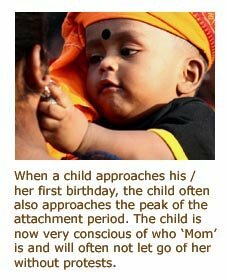 During this pre-attachment period the mother will 'warm up' the emotional bond with her sensitive and consistent responses. Crying, smiling, babbling and sucking to achieve and maintain the attention and proximity of the mother. 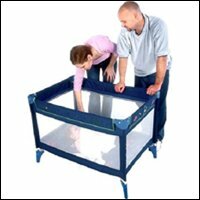 The infant may distinguish between caregivers but in general displays little preference. Baby separation anxiety in relation to the mother has not kicked in yet. Towards the latter part of the infant's first half year, the child starts to distinguish more clearly between known and unknown figures. 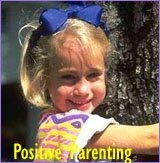 The child starts to get a sense of how his or her mother will react when they are anxious or distressed. The infant's early expectation of his or her mother's responsiveness lays the ground for the specific attachment behavior the infant will develop in half a year's time. Reaching out for, grasping hold of and clinging to the mother (of course crying, smiling and continuous vocalizing still occurs). At this age and stage of child development, the baby has developed a clear understanding as to who his or her primary caregiver is (typically the mother). This awareness often makes the mother the preferred caregiver. Strangers: They are not yet perceived as a real threat but they may make the baby uncomfortable and wary. Mother leaving the room; some infants show only the beginning of baby separation anxiety other infants have separation anxiety at full throttle by now. My own high need baby son was only about 3 months old when he would be quite upset and distressed if I left the room or was in the same room but wasn't the one holding him). At this age and stage of child development, the child's attachment behavior is very clear. The child is very conscious of good strategies for reaching the desired proximity of his or her mother. Clinging to, crawling and walking towards the mother if the child feels his or her security is threatened by either strangers or the mother's leaving. The space around the mother constitutes a secure base from which the child feels secure enough to explore the world. 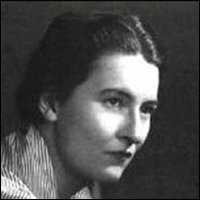 Primary caregivers and toddlers in this particular phase of attachment were used in Mary Ainsworth's psychology attachment lab experiment Strange Situation Protocol. 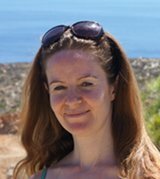 In the experiment Mary Ainsworth exposed toddlers to a 'strange situation' by making the mothers abandon the room, leaving the child briefly with a stranger in order to observe separation and reunion behavior. The result of this was three (later four) different attachment styles that infants typically display when feeling distressed. The child starts to see the caregiver as an independent person with his or her own agenda and goals. The child realizes that other people have feelings and goals and starts to navigate through this. When approaching 3 years, the child doesn't see physical separation as such a great threat anymore. With the continual development of mental consciousness the child starts to enter a phase where negotiation and compromise can be successfully applied. The child may be able to avoid separation distress if there is a plan for the caregiver's departure and arrival. This stage within child development is called the preschool stage. The child's need for independence and further exploration is growing in tune with his or her ability to cope with separation. However, the child still faces many new skills to be acquired in a world that may still occasionally seem threatening. So the child may still in times of distress want to stay close to his or her mother for protection, comfort and a sense of togetherness. 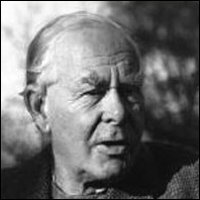 So according to the theorists of attachment theory and psychology attachment behavior at this age and stage of child development is not seen as childish regression. It would more true to view it as a natural way for the child to cope with, and survive in, a world that still seems overwhelming and threatening at times. Attachment issues of the school age stage are less physical and more psychological. 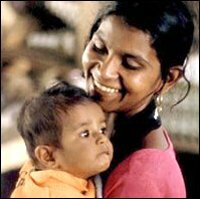 The character of the need for attachment has changed into awareness of availability rather than direct physical proximity: The child doesn't need to be near his or her mother as long as he or she knows that Mom is available if needed. 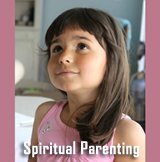 The child also starts to see the parents as partners with whom they will strive to have a fulfilling relationship which means they are more willing to make compromises that satisfy all needs and not just their own. Psychology attachment themes of this stage of middle childhood continue to evolve around negotiating how to maintain a secure base. 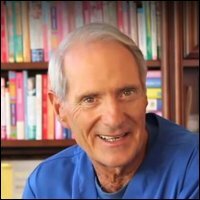 The child becomes more and more active in the planning process and the need to be independent grows constantly. Again, please note: All kids are different, and the above stages are only general and not an end result! Back to the top of this page about Psychology Attachment Behavior: Find Out When to Expect the Constant Clinging or the Letting Go of Mom's Skirt!